Repair corrupt & damaged MS SQL database files. Recovers all database objects: tables, triggers, rules, functions, deleted records, etc. SQL Database Recovery software is absolutely incredible. Yes it is brilliant. It took just few minutes to download and run the software and recover deleted records from corrupt MDF file. I must say, you can rely on this software. Try the software once. There are many corruption errors that users face during SQL Database corruption. Mentioned below are some of the common errors. Repair your corrupt MS SQL database (MDF/NDF files) that has come to halt, due to corruption problems in MDF/NDF files, from reasons like hard drive failure, media contamination, and virus intrusion etc. The tool fixes the MDF/NDF file errors and restores all SQL database files. SQL Recovery tool is competent enough to restore all the database objects contained within MDF/NDF files that include tables, views, triggers, primary keys, indexes, unique keys, stored procedures, foreign keys, default values, checks, rules, and user data types. 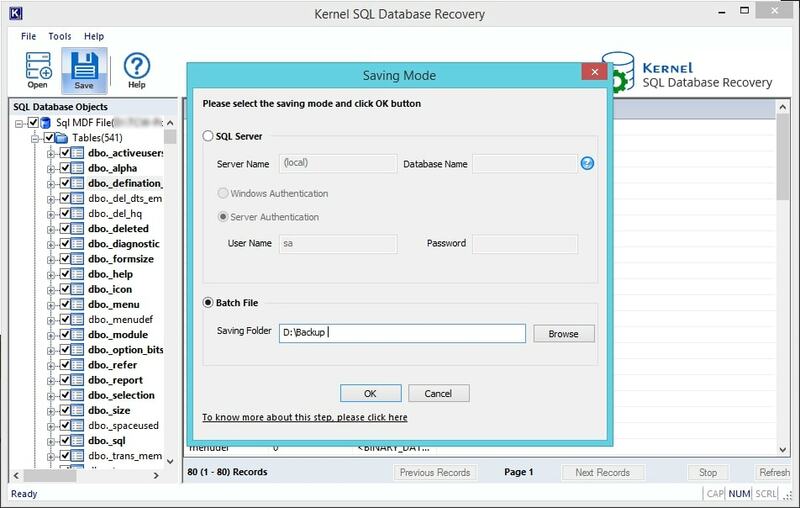 SQL Recovery tool allows the recovery of MS SQL server backup files and allows creating the script file(s) for restoring the deleted records separately. You can create a new database and save data directly into it. SQL Database repair software also comes with advance setting which assists user in retaining the integrity of the restored objects even after the successful completion of SQL database recovery procedure. SQL Database repair software facilitates its user with two different saving modes option – SQL Server & Batch File. SQL Server option allows saving restored objects directly in SQL Server, while the Batch File mode saves the batch file of the rebuilt SQL database on a desired location. The preview gives a perfect glimpse of what your recovered data will look alike—tables are represented in hierarchical order. The tool provides a preview of maximum 1000 records in a page. The user can select any table to view its components further and verify the data authenticity before saving. MDF recovery tool supports UNICODE characters for database recovery so that user can restore the data in different languages. The user will face no more readability issues after recovery. The software is compatible with all versions including Windows 10/8.1/8/7/Vista/XP/2000, SQL server 2017/2016/2014/2012/2008 R2/2008/2005/2000, & Windows Server 2016/2012 R2/2012/2008 R2/2008/2003 R2/2003. 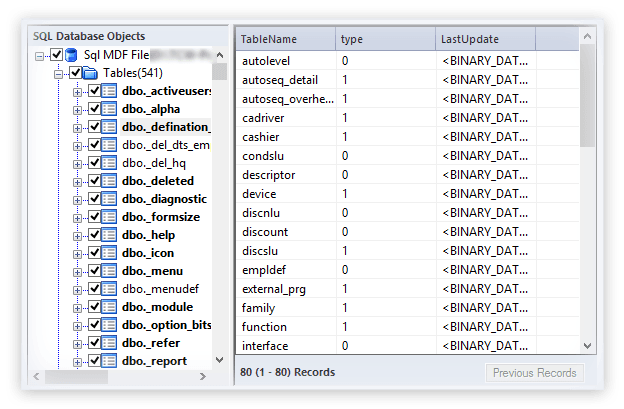 SelectIn this step, make selection of corrupt SQL Database along with SQL Database version with which the MDF/NDF file will be restored. PreviewIn this step, the software will enlist the SQL database objects enabling its user to have easy preview and verification before saving at respective location. Save In this step, make selection among the Saving Mode options, and provide the saving location to save restored objects. 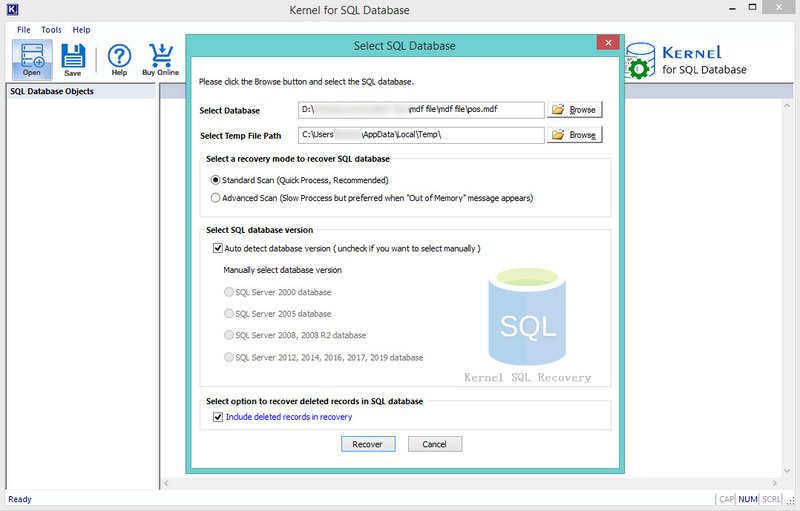 How to recover corrupt SQL database using Kernel SQL Database Recovery? Install and launch the software on your system. Select the specific corrupt SQL database file and click Recover. After the file is added, select the specific objects and tables, and click Save. Select the specific saving mode, i.e., SQL Server or Batch File and click OK.
Add Server Name and Authentication for saving data to SQL Server. Select a specific location to save data in Batch file mode. The file will be restored within a few seconds based on the file size. Can I recover lost database objects after an SQL database corruption? Yes, you can. 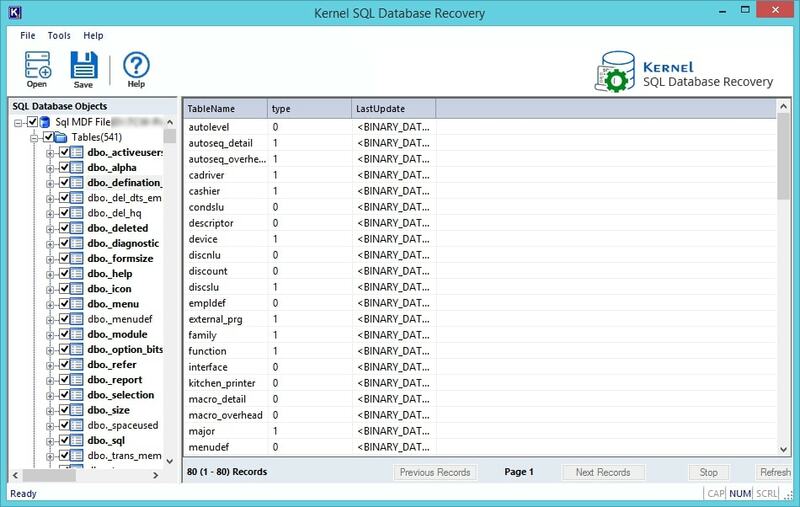 Kernel for SQL Recovery allows effortless recovery of lost database objects from corrupt MDF/NDF files. It retrieves all of the database objects such as tables, triggers, rules, deleted records, etc. with its original properties and structure. Can the software identify the version of SQL Server? Yes, it can. The software features a smart auto detect function that allows you to automatically detect the version of the SQL database before the recovery. Can I verify the recovered database components before saving? Yes, you can. The SQL Repair tool offers inbuilt preview facility wherein you can view all database components, before actually saving them. This preview facility is also available in the free demo version, that makes it easier for you to evaluate before purchasing the paid version. Does the tool require Live SQL Server environment to recover MDF file objects? No. 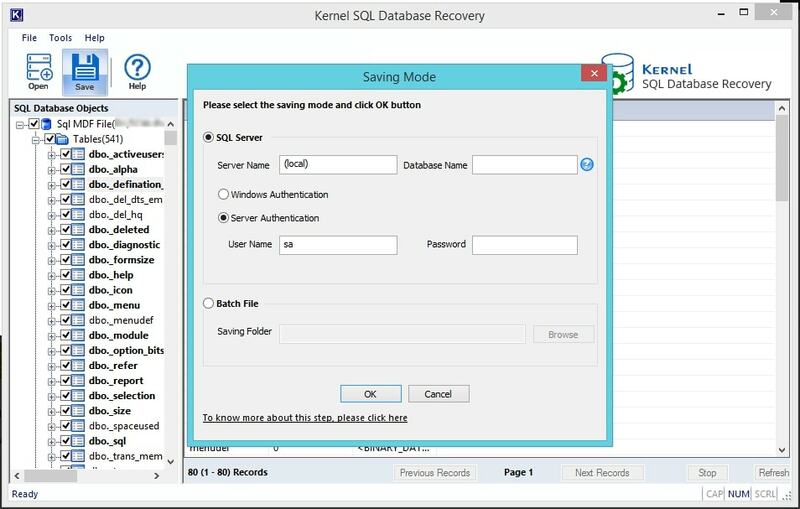 Kernel for SQL Recovery tool does not require live server environment to recover database objects from SQL Server. 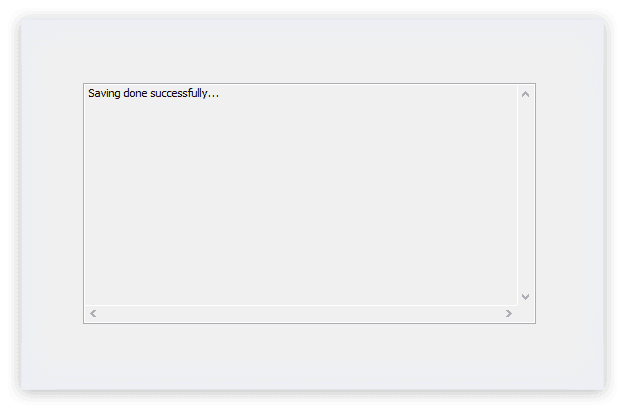 However, it would require the environment for saving/exporting the recovered objects to SQL Server. Is there any database file size limitation? No. The tool performs SQL Recovery from any size of MDF and NDF files. There is no file-size restriction for SQL recovery. Does the demo version show complete preview of all database objects? Yes, it does. The demo version is a free tool to evaluate software performance, before purchasing the licensed software. However, to save the recovered database objects, you need to purchase the licensed version. The tool is brilliant from all angles. I suggest it for saving your data in danger. I used the software after struggling with various manual methods and failed due to their complex nature. "I thought the tool was not working in my system and I talked rudely to the support team for this. Later on I get to know the problem was with my system. But I appreciate the patience and calmness of technical team for understanding me and solving my issues." Get the clear preview of selected data. Save data directly to SQL server through log in details. Save Batch file at desired location. 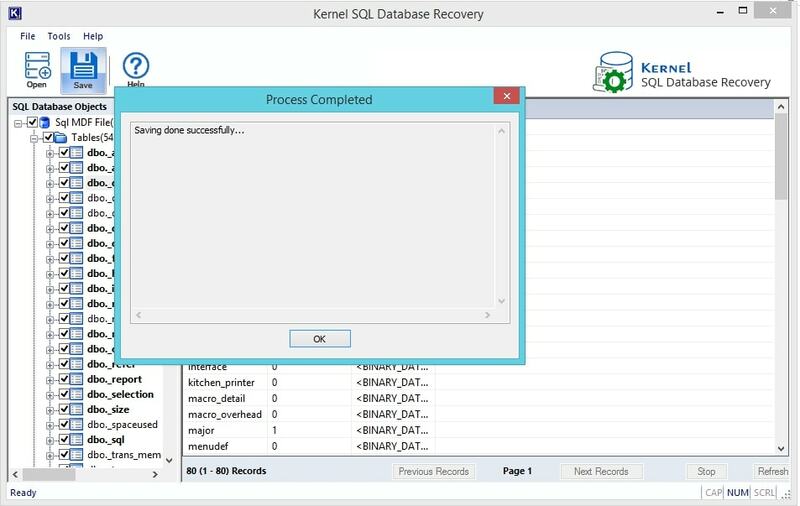 Now recovering data from a corrupt SQL database (MDF/NDF) file is much more easy and secure with Kernel SQL Database Recovery 18.2. The tool can save data by creating a new database and saving data in it. You can see as much as 1000 records in the first page preview. Additionally, you can save a large amount of data in minimum time. 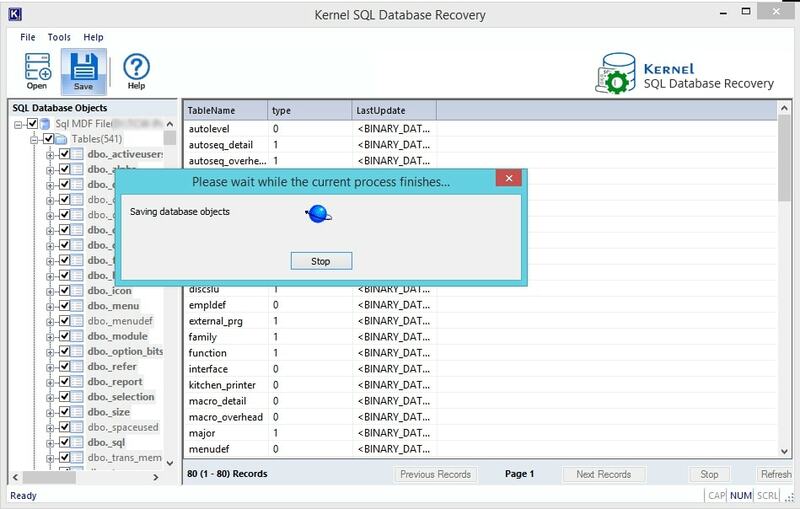 Lepide Software has released Kernel for SQL Database Recovery version 17.1 with extended capabilities and software support. With these improvements, the tool can now deal with large-sized SQL databases more efficiently. Apart from MDF files, it can recover NDF files as well. With the enhanced functionalities, the tool can recover UNICODE characters too. And the tool now is compatible with Windows 8/8.1/10, SQL Server 2012/2014/2016/2017 and Windows Server 2012/2012 R2/2016. Lepide Software Pvt. Ltd. announces the successful release of updated version of Kernel for SQL Database software. Integrated with advance algorithm, the new revised version 13.05.01 is now competent enough to recover large and heavily corrupted databases in almost every condition. In addition, the new version supports data recovery from SQL server version 2012 and can also be installed on systems running Windows server 2012 OS. Kernel for SQL Database version 11.07.01 is now available for users. The updated version of the software now supports MS SQL 2000, 2005, 2008 and 2008 r2. Embedded with more interactive GUI, the updated version of Kernel for SQL database will definitely enable users to more expediently resolve SQL database corruption issues. The Kernel for SQL has been updated. The improved v.7.08.01 version now has much powerful recovery engine and effectively handles the major corruption. Updated version of Kernel for SQL released today. Now with more powerful recovery engine, minor bugs of the former version have been fixed?in the?updated version 7.07.02. 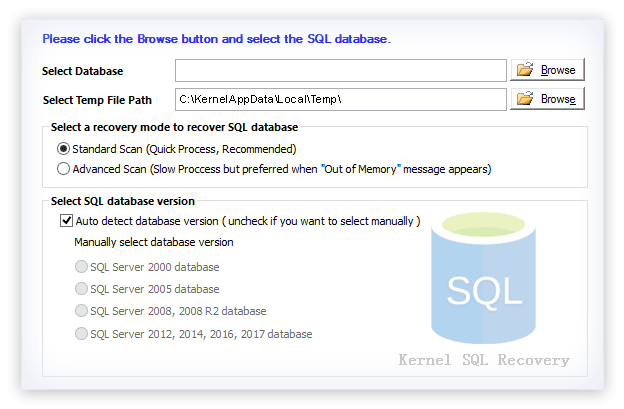 Kernel Recovery for SQL version 7.07.01 now has much more powerful recovery engine than its previous version and effectively handles the major corruption. 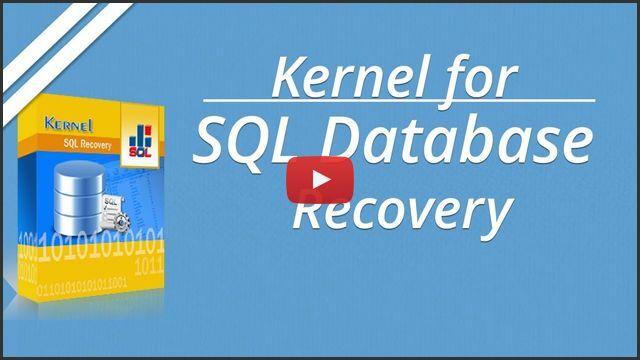 Nucleus Data Recovery the premier provider of best data recovery software and data recovery services announced the release of Kernel Recovery for SQL. The SQL database repair software effectively repairs the corrupt databases and recovers data from the corrupt .mdf files. SQL Servers are generally used to store data on networked file servers. Many companies rely on these databases to remain accessible in order for the smooth running of their business. 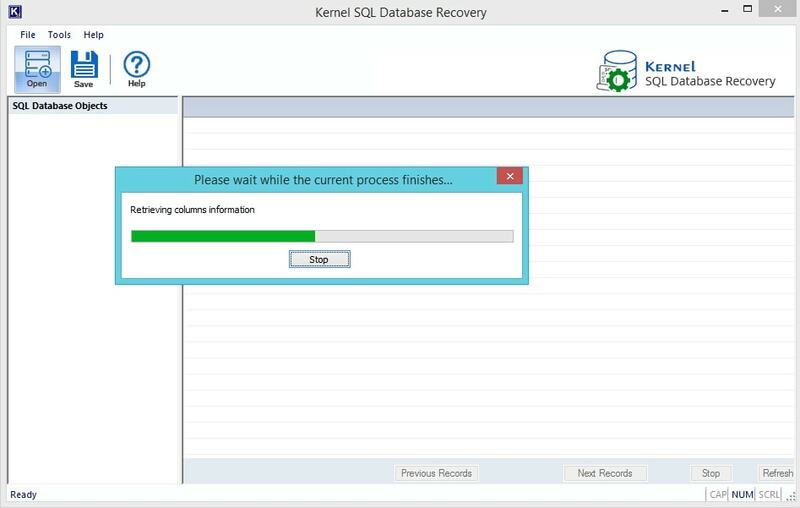 Kernel Recovery for SQL retrieves data from the corrupt .mdf files and supports Microsoft SQL Server version 2000 and 2005. The SQL recovery software equipped with QFSCI technology promises fast, secure, accurate and result-oriented recovery of data. Repair & Restore lost, corrupt/damaged MDF files back to MS SharePoint.